Rangers hosted the first Old Firm game of the season already five points behind cross-city rivals Celtic after six games played. Brendan Rodgers’ side extended their winning run at Ibrox despite a resilient defensive display from the home side, which served to highlight some of the champions’ shortcomings. 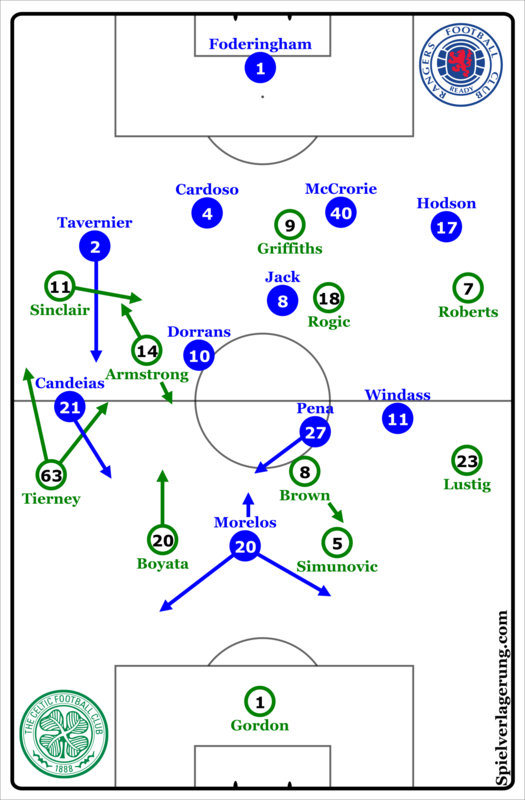 Rangers displayed an organised and effective pressing scheme in order to prevent Celtic from establishing the level of control they have been accustomed to domestically. In the first line, there was little in the way of direct pressing from striker Alfredo Morelos on either of the Celtic central defenders, in effect turning their default structure into a 4-1-4-1-0. Carlos Pena and Graham Dorrans acted as man-oriented eights, marking the away side’s double pivot of Stuart Armstrong and Scott Brown tightly, while Ryan Jack sat behind these two, picking up Tom Rogic. The scheme was fairly simple in its idea. Passes through the centre were heavily discouraged by the tight marking as well as the access the wide players had to double up in the middle if required. 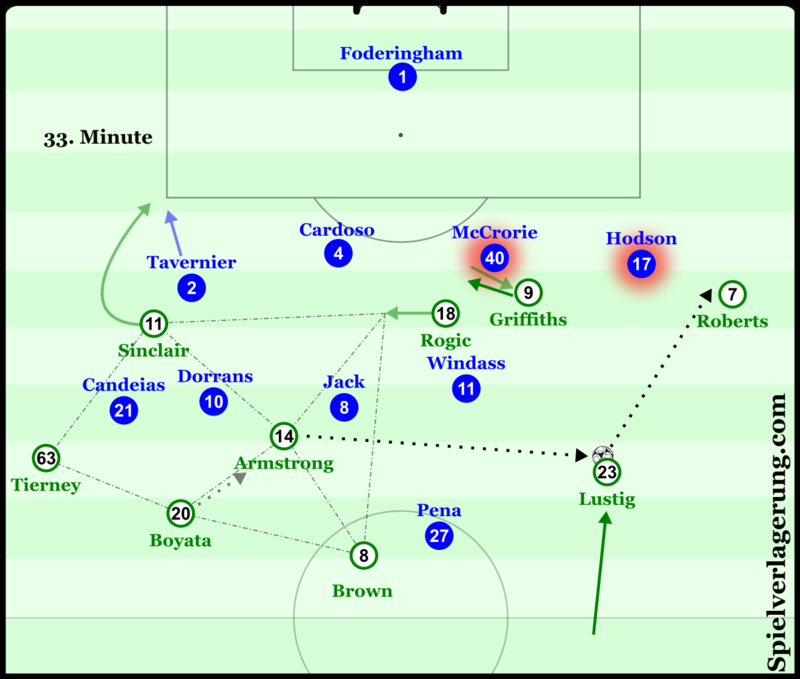 Therefore, Celtic were forced into either progressing through either flank – where they were pressed immediately with great intensity – or with longer passes looking for Leigh Griffiths in depth. Neither alternative proved particularly fruitful for the away side, and they struggled to gain space or position in a controlled and consistent manner. Though Pedro Caixinha’s players’ marking was tight – and in the case of right-sided players Candeias and James Tavernier, almost quite extreme in their tracking of Kieran Tierney and Scott Sinclair – it was by no means rigid. There was some freedom for one of the midfielders, almost always Carlos Pena, to join Morelos in the first line in certain moments, usually when he could “jump” onto a potential free ball-carrying central defender after tracking Brown, keeping the Celtic captain in his cover shadow. Rangers’ wide men, Windass and Candeias, were given licence to tuck inside to mark in the centre if they were ball-far or if the opponent was otherwise free, thereby prioritising targets close to the ball, giving Rangers a workable level of horizontal compactness. This behaviour from the wide midfielders in turn occasionally afforded the Rangers eights to be somewhat position-oriented – prioritising the maintenance of manageable distances between themselves and their teammates, blocking central passing lanes and being close enough to assist in the recovery of loose balls. Windass’ intense pressing of Lustig, coupled with central man-orientations, forces the defender into a low-percentage channel ball. With central play discouraged as such, Celtic were often led to trying to find avenues to progress from the flanks. From here, Windass would press Mikael Lustig aggressively. This led the Swede to either make rushed passes to marked teammates – who would most likely be prevented from receiving in a position to turn forwards or forced into losing possession – or playing long vertical passes down the flank, which could be easily dealt with by the defensive line. Morelos compounded this position by often lurking in a way to threaten the pass backwards towards the centre. 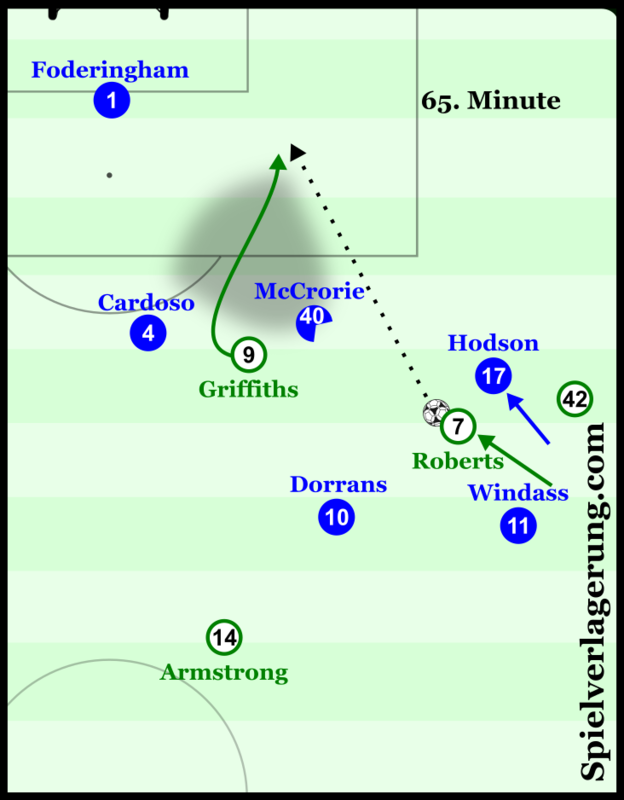 On the opposite side, Candeias occasionally performed a similar role on Boyata, but tended to be much more strongly oriented on Tierney as he pushed forwards, with Tavernier marking Sinclair when the winger dropped away from the last line. While defensive systems based on a man-oriented approach can, in theory, be easily manipulated, against this current Celtic team they are a more than viable option. Celtic’s response to such systems usually revolves around the clearing of central areas through movements to the outside of the possession structure. This has worked well for them both domestically and in Europe, particularly in situations where an opponent prioritises access to an outward-moving Celtic player over spaces in the centre of the pitch. Rangers, however, tended not to fall into these traps. Their man-orientations were performed in somewhat of a more zonal manner, where control of the centre was the ultimate goal, rather than disrupting their defensive structure through the futile chasing of Brown et al. As such, the dropping movement of Brown to the fullback areas, so often the champions’ favoured space-opening mechanism, served only to remove a central passing option – further ceding control of the middle. Ultimately, Celtic’s inconsistency in their manipulations of man-oriented defensive systems, or dismarking, makes approaches such as the one Rangers employed on Saturday somewhat viable to other teams in the league. Choosing not to press the first line of build-up may seem counter-intuitive at first, but Celtic’s central defenders’ actions in possession does not tend to contribute greatly to their collective dismarking. Dedryk Boyata often found himself bringing the ball forward through the left wing or halfspace, and aside from one outstanding action (a fantastic provoking dribble and diagonal pass to Rogic), his effectiveness was limited, either through his own perceptual or technical shortcomings, or the inefficient positional adjustments of his teammates – coming too close to the ball, and not opening passes in ball-far spaces to play around the pressure that builds around the ball-carrier after such dribbles. While Simunovic tends to be the better ball-player of the two central defenders, he was similarly ineffective at times. The Bosnian international is willing and more than able to break lines of pressure with his passing, yet more often than not his distribution is best labeled as “cautious”. Direct passes behind the opposition’s midfield are often rejected in favour of horizontal passes in moments when he stands with large spaces in front of him. Furthermore, the staggering and structure of Celtic’s midfield continued struggling to facilitate central progression. While they are able to adeptly open direct passes to higher players, there is often a lack of adequate adjustments to immediately support the receiver. This tends to stem from poor timing or late recognition of the situation from the third man, or connection-breaking movement towards the ball from the receiver himself. In either case, potentially dangerous vertical passes are often followed by touches or passes back outside the opposing defensive block, resulting in a loss of that player’s positional and dynamic superiority. Side note: though these systemic issues are a stumbling block for Brendan Rodgers’ side, they are by no means unresolvable. Indeed, a more than adequate solution already exists within the playing squad, in the form of Callum McGregor. It is in exactly these situations that the midfielder excels – connecting players in advanced positions to the ball, maintaining spacing, balancing the movements of teammates to ensure that a strong positional structure is upheld. 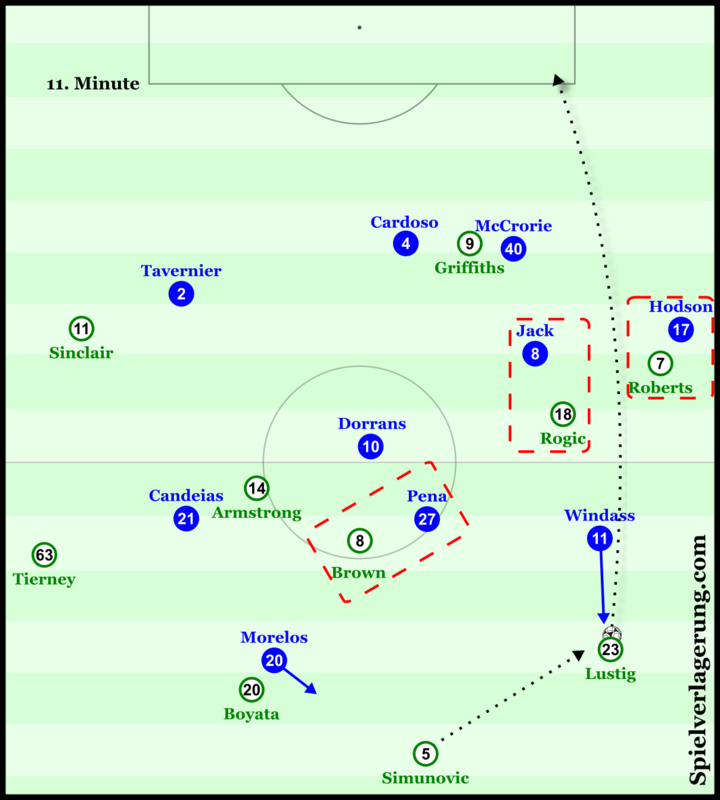 For all their troubles in establishing position in the centre, Celtic were able to create some positive moments through the left halfspace. With their customary 4-2-3-1/3-4-2-1, and especially the movement of Sinclair and Armstrong within that, Celtic had a noticeable left-side focus in their spacing. Sinclair and Tierney’s dynamics, with Sinclair dropping diagonally into the halfspace while Tierney overlapped, not only created opportunities for the left back to find a free run into depth, but also had the effect of opening space in the centre. Sinclair often receiving back to goal often brought his first touch towards the middle, taking him into Ryan Jack’s zone. Jack moving across to engage Sinclair, coupled with a lack of cover from particularly Windass in the six-space, left Tom Rogic almost completely free in front of the Rangers back four – able to take dangerous shots or connect Patrick Roberts on the ball-far wing to the play. Celtic’s best breakthroughs through the left almost all resulted from their dynamics on that side. Sinclair and Tierney’s interactions are key in this regard. The aforementioned Sinclair-in/Tierney-up dynamic forms a pivotal part of Celtic’s 4-2-3-1/3-4-2-1 structures, but other dynamics such as Armstrong’s diagonal runs beyond the defensive line or (perhaps the most interesting) Sinclair pulling the Rangers fullback to the touch line before Tierney bursts through the left halfspace to receive forwards, are also important. While their dynamics helped negotiate some aspects of the Rangers marking, it was Celtic’s structure which enabled them to reduce the hosts to a solitary shot on target. Celtic’s occupation of the area near the halfway line when they had possession in Rangers’ half made it exceedingly difficult for Pedro Caixinha’s side to launch counter attacks or indeed keep possession at all. Celtic’s possessional structure tilts heavily to the left side, particularly with Boyata dribbling in. If breakthroughs can’t be made directly through Sinclair or Rogic, they switch play quickly to Roberts and isolate him for 1v1s. for their rivals through their organisation of their rest-defence on the halfway line. Forming a 3-1 structure, with the ball-far full-back sitting alongside both central defenders behind either Brown or Armstrong (although the former performs this task far more reliably) in order to hold strong access with multiple players to the wide range of spaces a long clearance or a prospective counter attack could pass through. Against Rangers this was of great importance. The home side launched their attacks very quickly, either with longline passes to Morelos in the channels, centrally to Morelos and Pena, or on the flanks with direct dribbles from Candeias and constant depth runs from Tavernier. Strong spatial coverage in the last line enabled Celtic to prevent Rangers from bringing their block up the pitch, and establishing position in the Celtic half. Celtic’s left-sided focus in their possession structure had a secondary function if they were unable to break through directly. Against a man-oriented defensive system, it naturally follows that if the team in possession overloads one side of the pitch, that the opponent will do the same, maintaining access to everyone on that side. This leaves the ball-far side sparsely occupied. In Celtic’s case, with most of their play starting on the left, the ball-far side almost always contained Patrick Roberts, few defenders, and plenty of space. Not much unlike isolation plays in basketball, Celtic’s spacing kept them out of the Manchester City loanee’s way, allowing him to flex his great dribbling ability particularly against Rangers left back Lee Hodson. McCrorie’s field of view is manipulated by Roberts’ diagonal dribble. Griffiths ‘hides’ himself with his first movement away from the ball-near defender, giving him more of the blind spot to run through. While he created some very good opportunities when dribbling past his man on the outside, it was when he ventured diagonally into the centre that the best chances, and ultimately the second goal, came. Part of what makes diagonal dribbling so dangerous (on top of what TP outlines in this piece) is its effect on the field of view of nearby opponents. A dribble that starts on the flank and progresses diagonally will attract the attention of ball-near players, who will most likely visually track it across the pitch. While their field of vision moves from the flank to the centre, their blind spot mirrors it – moving from the centre to behind them. This can be exploited by diagonal runs from central players, able to stay (as Griffiths did for his goal) on the blind-side of the ball-near central defender for the vast majority of his run. Celtic’s unbeaten run remains intact, though Saturday’s was a performance which will no doubt encourage not only Pedro Caixinha and Rangers, but also managers of the other ten Premiership clubs. That it took 50 minutes and a fortuitous bounce in the box to give the away side the lead was perhaps an unfortunate way to go down for Rangers. However, their defensive approach of flexible man-orientations and aggressive midfield pressing is one which clearly caused the champions some discomfort.